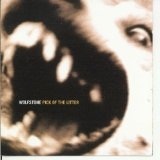 Wolfstone are a Scottish musical group founded in 1989, who play Celtic rock. Their repertoire consists of both original songs and traditional folk pieces. To date, they have released seven studio albums, the latest, Terra Firma, in 2007. The band record on their own label, Once Bitten Records. The group are named after the "Wolfstone", a Pictish stone originally sited at Ardross, Easter Ross, close to where the band initially recorded. The roots of Wolfstone go back to when fiddler Duncan Chisholm met guitarist Stuart Eaglesham at a pub session. An idea becoming realised, Stuart's brother and keyboard player, Struan Eaglesham, was offered a place in the line-up, as was piper Allan Wilson from Bonar Bridge. Roger Niven from the Black Isle played guitar, but was soon replaced by Andy Murray. In 1989, Wolfstone performed their opening show at the first Highland Traditional Music Festival in Dingwall, supplemented by sequenced bass and drums.